Ars Aesis and Buratto Sfilato - New Book! Giuseppa Federici's latest book is out and this time she's got a variety of things to show us! 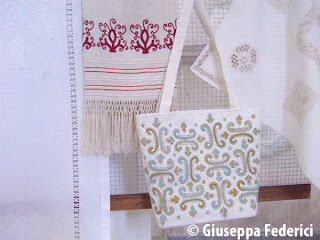 She has created some beautiful embroidery designs using a variety of stitches, some specifically from other Italian needlework techniques and others form traditional embroidery including some fascinating research which has lead her to the embroideries of Portugal. 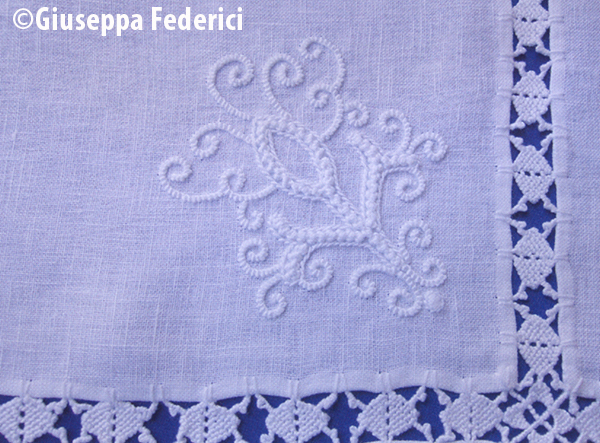 Ars Aesis embroidery takes the Latin name for Jesi which is the town where Giuseppa Federici calls home in the Marche region of Italy. She wanted to dedicate an embroidery style to her local area and Ars Aesis features motifs of local flowers, crops and trees. Inspiration also comes from the beautiful frescos and interior decorations of the local early 19th century Villa Salvati. Ideal fabric is listed as homespun, but if you don't have any of that handy, compact linens will work just fine. 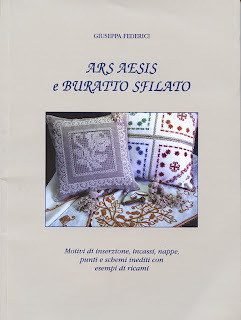 Threads used for Ars Aesis are crochet threads like DMC Babylo or Anchor Freccia. Using these threads results in lovely textured work. Step-by-step colour photo sequences show the execution of both the embroidery stitches used and the insertion stitches used to join pieces of fabric together. There are also needle lace stitches for open areas and withdrawn thread stitches for borders, hems and framing. The how-to section is quite extensive and is an impressive 23 pages long including a section on tassels. There are over 30 motif designs. There is a short section of the book dedicated to Buratto Sfilato (Drawn Thread Work done on contemporary Buratto fabric). A lovely Caterina de' Medici border motif is stitched around an area that is withdrawn with a pattern of a rose executed in linen stitch. While neither the Catherine de'Medici embroidery nor the linen stitch is explained, this is still a very important section. The entire withdrawn area is explained in step-by-step detailed photos showing closeups of both the back and the front of the work. There is also an edge treatment explained and if you want to learn more about Catherine de'Medici embroidery, Giuseppa Federici has written three books on it. This book ends with a photo gallery of embroideries and a valuable bibliography to help you in further study. It is 80 pages long and the text is in Italian. In Europe you can purchase by bank transfer directly from the author herself. Right now I'm sure she is madly getting ready for the Italia Invita Forum in Parma, so give her a few days to answer you. If you're overseas, Tombolo Disegni will be carrying it. She too is getting ready to go to the show in Parma so you may not get a reply to your email right away. 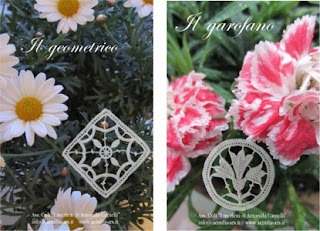 As I hinted a few posts ago, there is an Aemilia Ars needle lace insert in the May/June 2013 issue of Piecework magazine by the Associazione "I Merletti di Antonilla Cantelli". The project includes step by step photos which had to be rather small in the magazine due to space constrictions but if you have a magnifying glass handy, they are valuable source of reference when executing the lace. I had another reader write to ask me for more details on how to execute the "gruppetti" picots which are placed at the intersection of two overcast bars. 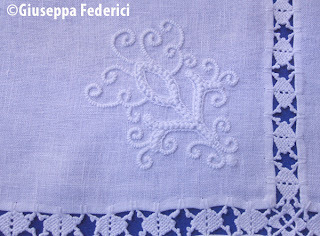 As I am only a beginner when it comes to executing this lace, I can't pretend that my "gruppetti" are anything to show off but the ladies of the Associazione "I Merletti di Antonilla Cantelli" assure me that practise, much practise improves them. I know that's not a magic answer but it's all I have for you. These ladies have been doing this lace for many, many years to achieve the high level of expertise in their lace, don't be too hard on yourself if yours doesn't look the same, but don't give up either! If you're fortunate enough to be going to the Italia Invita Forum in Parma in May this year, stop by and see the ladies at their booth, you can catch their latest book or better yet, take their mini-courses! 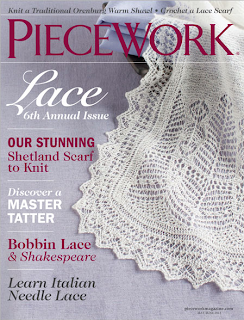 I hope you enjoy the article in Piecework, somehow the photos never do justice to what is the most amazing piece of needle lace I've ever been close to.